FILE - A puddle blocks a path that leads into the Panther Island Mitigation Bank near Naples, Fla., June 7, 2018. Experts say the Trump administration’s move to redefine what constitutes a waterway is threatening a uniquely American effort to save wetlands from destruction. A new proposal from the Trump White House would roll back more Obama-era environmental regulations. Trump administration officials say Tuesday's proposed change in the Clean Water Act provides "a clear, understandable, and implementable definition" of what kinds of bodies of water the government can regulate. Environmental groups say the new rules are a concession to industry and will pollute the nation's already polluted waterways. During the Obama era, what constituted "Waters of the United States" was expanded under the Clean Water Act to include all kinds of wetlands from ditches that only contain water part of the year, to wetlands adjacent to larger rivers or lakes. The definition was created to help ensure that America's water was kept clean at the source, with the assumption being that it was necessary to regulate creeks, ditches and wetlands because they eventually flow into bigger bodies of water. But farmers, construction companies and landowners bristle at what they say is the expansive nature of the definition, arguing the rules prohibit them from using a significant portion of land under their control. Reacting to those concerns, the Trump administration is rolling back Obama-era protections in what EPA Acting Administrator Andrew Wheeler calls a "simpler and clearer definition" that will "help landowners understand whether a project on their property will require a federal permit." 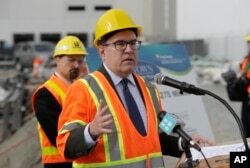 FILE - Andrew Wheeler, the U.S. Environmental Protection Agency's Acting Administrator, talks to reporters after touring the Georgetown Wet Weather Treatment Station in Seattle, Oct. 3, 2018. The new rules say that the federal government will now only regulate "traditional navigable waters, tributaries to those waters, certain ditches, certain lakes and ponds, impoundments of jurisdictional waters, and wetlands adjacent to jurisdictional waters." That leaves out huge areas of wetlands, meaning "features that only contain water during or in response to rainfall (e.g., ephemeral features); groundwater; many ditches, including most roadside or farm ditches; prior converted cropland; stormwater-control features; and waste-treatment systems" that were covered will no longer be subject to federal regulation. Christopher Williams from American Rivers says the new rules will remove "protection from wetlands that don't have an apparent surface connection to another water body, a lake or a river, and there are millions of acres across the country that are isolated like that." The argument is that these isolated bodies of water — some of which don't exist year-round — don't need protection because they don't impact the nation's major waterways. "These ephemeral streams are incredibly important parts of a freshwater ecosystem," he told VOA, adding that the Obama-era rules are scientifically dense and lay out the "important ecological connections between all these types of water, whether it's wetlands or ephemeral streams, isolated or otherwise." The old regulations made the case that these areas "should all be included in the definitions of 'Waters of the United States' if you're trying to conserve that freshwater system as a whole," Williams said. Some environmental groups vow to fight the new rules. "This proposal is reckless," Jon Devine from the Natural Resources Defense Council told VOA via email. "... and we will fight to ensure it never goes into effect." There is a 60-day comment period before the rule can be applied. In addition, the Obama-era regulations are in place in 22 U.S. states, while the rules are held up in court in another 28 states. Williams sees a big change in the way the Environmental Protection Agency has evolved under the Trump administration. "It's clearly changed in that much of the rhetoric of the current EPA is about balancing environmental regulations with economic development," Williams said, "and making sure that they are efficient and not costly to the economy and don't interfere with business activity." Tuesday's actions follow the U.S. refusal to endorse a new U.N. report on climate change at climate talks last week in Poland. They also follow a White House plan announced last week that would eliminate requirements that coal plants install expensive new technology designed to capture carbon emissions. Such changes fall under Trump's campaign promise to roll back government regulation, saying environmental mandates amount to a "war on American energy." The president also denies the scientific consensus that humans are warming the planet. Responding last week to the 1,600-page National Climate Assessment report produced by 13 federal agencies outlining the potentially devastating impacts of climate change, the president said, "I don't believe it."